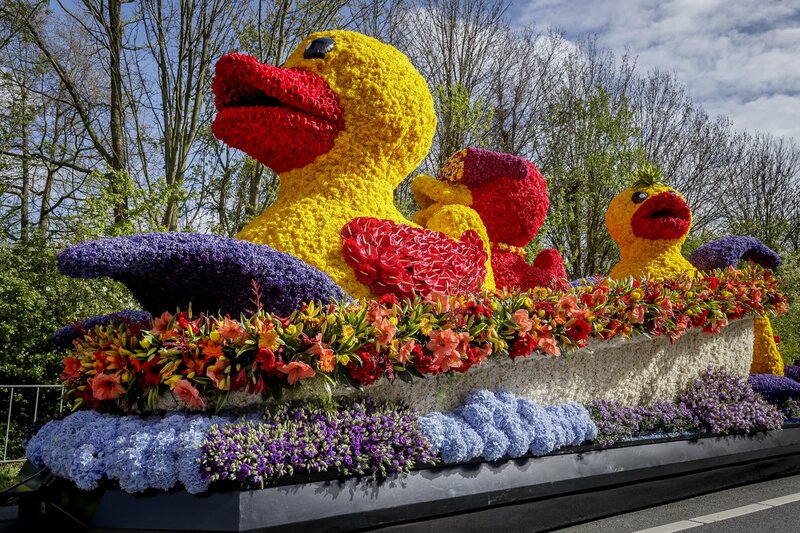 The 72st edition of the Flower Parade of the Dutch Flower Region rides the 40 km long route from Noordwijk to Haarlem on Saturday, April 13st. At about 3:30 pm, the flower parade will pass at the Keukenhof boulevard (main car park). The flower parade can be admired along the road at the Keukenhof main entrance. 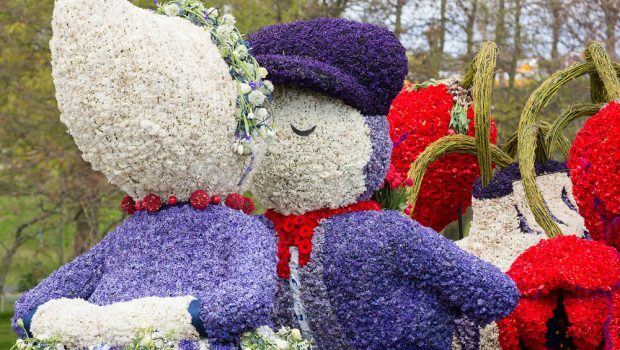 Before and after the Dutch Flower Parade you can continue your visit to the Keukenhof. How do I get to the Keukenhof / flower parade? Please not it will be very busy around Keukenhof and roads will be closed from 14:00 to 17:00. You will not be able to access or leave Keukenhof’s main car park during this time. We recommend that you arrive at Keukenhof before 12:00. Buy your Keukenhof tickets and parking ticket online and avoid the long wainting line on Flower Parade day. Bus 858 and 854 (Keukenhof Express) will run according to the normal timetable until 13:00. Travel to Schiphol or Leiden as early as possible because we expect heavy traffic in the Bollenstreek [bulb growing area]. The earlier you leave, the less time the journey will take and the shorter your wait at Schiphol and the flower park. Starting around 13:00/14:00 the buses will detour through Leiden. After 14:00 there will be no more buses to Keukenhof. Ensure you are in Lisse by that time. Approx. 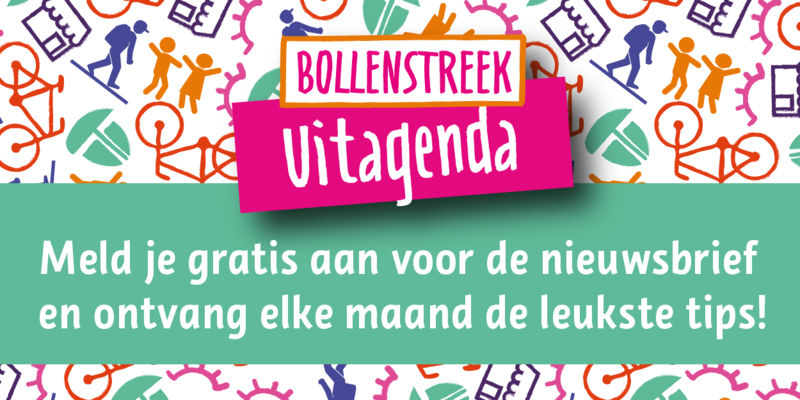 16:00 the roads in the Bollenstreek [bulb growing area] will be reopened and Arriva (Keukenhof Express 858 and 854) will once again be able to run its buses according to the timetable. Please note there may be long queues at Keukenhof and the buses will be crowded. Until 11:00 Bus 50 will run according to the normal timetable. Please note it will be crowded on the buses: the earlier you depart, the better. There will be an increasing number of delays on the route to Lisse between 11:00 and 13:00 due to heavy traffic. We cannot guarantee that every bus will be on time. After 13:00 Bus 50 will no longer run to Keukenhof. Because the flower parade goes from Lisse to Haarlem, Bus 50’s route to Haarlem will be blocked. Unfortunately there are no alternatives from Lisse. The buses from Lisse will slowly start running according to the timetable from 19:00 onwards. If you are travelling to Haarlem, go to Leiden Central Station using Keukenhof Express 854 and then take the train.